Wisdom teeth can be a real pain, literally! About 70-80 percent of the population will have between one and four wisdom teeth develop in early adulthood. Oftentimes, these teeth will need to be extracted for a number of reasons. The most common being that our jaws are usually not large enough to accommodate these new teeth, and the emergence of them can cause infections, discomfort, and damage to existing teeth. Not to mention that because these teeth are so far back, many people have trouble properly caring for them, increasing the risk of cavities, gum disease, and other conditions. At Shores Family Dentistry, we can perform wisdom tooth extraction for teens and young adults, or older adults who are experiencing infections or other issues relating to their wisdom teeth. While we like to be conservative with our approach and not unnecessarily remove teeth, wisdom teeth may need to be removed if they might cause problems later in life, even if they are not causing now. The best way to know if your or your child’s wisdom teeth should be removed is to come to our family dentist for an evaluation. Be sure to schedule an appointment soon, and keep reading to learn more about wisdom teeth! Curious About Wisdom Teeth Extraction? Get In Touch Today! Once you know that wisdom teeth typically show up when a person is between the ages of 16 and 26, you don’t have to be particularly wise to guess where they got the name. Technically they are “third molars,” but wisdom teeth got their colloquial name because they show up as we enter adulthood and are presumably wiser than our younger self. Just like some other parts of our body — including the appendix, the tailbone, and parts of the ear — wisdom teeth are vestigial structures, meaning we don’t need them. While once useful, sometime throughout the course of evolution we lost the biological need for these structures. Our ancestors once used these third molars to grind down plant tissue. If you’ve seen skulls and renderings of early humans, you will notice that their jaws were larger to accommodate these teeth. As our diets changed through history, there was no longer a need for these teeth. While our jaws have become smaller, evolution hasn’t quite caught up with the times and almost all people will grow at least one wisdom tooth. Most people develop four wisdom teeth, and very few will never have wisdom teeth emerge. When third molars do not have enough room to grow, they become impacted, meaning they are trapped in your jaw or under your gums. At this point, it is vital to have a wisdom tooth extraction in order to maintain the integrity of the rest of your teeth. 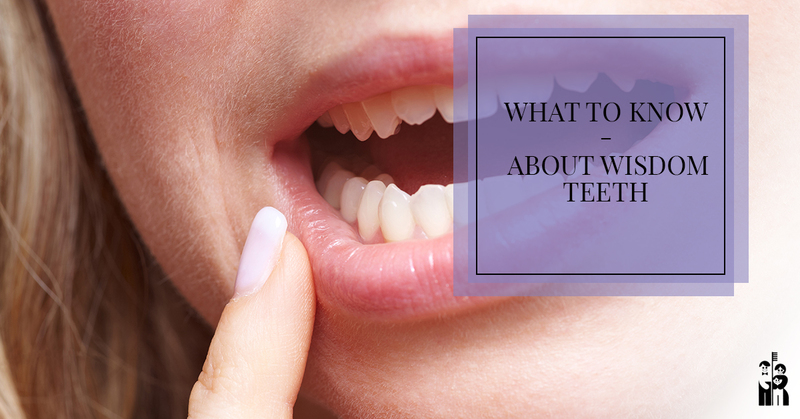 Perhaps the better questions is, “How do I know if my kid has wisdom teeth?” Remember when your children were just little babies and they would wail, unsoothable for hours because they were cutting a tooth? Growing wisdom teeth is a similar process. While not the same for everyone, typically there will be some pain and pressure as the teeth cut through the gumline. You can also look out for general pain in the back of the jaw, throbbing pressure, redness and swelling, or even notice that your front teeth are suddenly crooked as your wisdom teeth maneuver your other teeth. Do I Need To Have My Wisdom Teeth Out? The only way to truly determine this is to make an appointment with your Fort Collins dentist. Your dentist will be able to examine the position of your wisdom teeth before you even know they are there. If they are still developing, your dentist will keep an eye on them to monitor what position they are growing in and whether or not they will become impacted. The sooner you can have a wisdom tooth extraction, the better. The longer your third molars are in your jaw, the denser and more anchored they become. Extractions and recovery typically go smoother when the wisdom teeth are in the earlier stages of development. Schedule A Wisdom Tooth Evaluation! If your child, or yourself, are between the ages of 16 and 26 and have not been evaluated for wisdom teeth, we highly encourage you to make an appointment at our family dentist. The sooner you can come in, the better, as wisdom teeth extraction only gets more difficult as you get older. We look forward to meeting you!